Freecharge, one of the leading online recharge platforms; has invited bloggers to its workspace. Freecharge started as a recharge website six years ago, now was acquired by Snapdeal for a huge price of USD 400-500 Million. 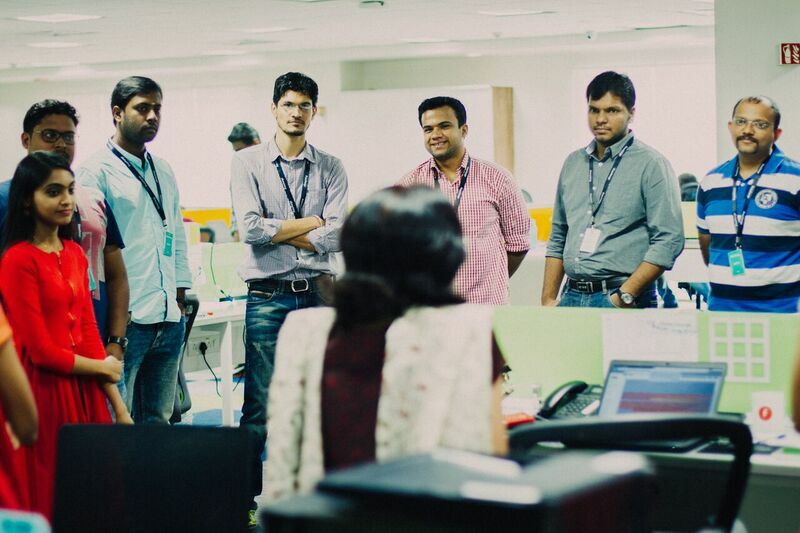 Freecharge now has more than 100 employees, and they work on various teams to handle the apps, transactions, etc. Here’s how the tour of its workspace went on. Welcome: The Monday morning kicked off with the bloggers being served delicious breakfast in the Freecharge cafeteria. They were greeted with goodie bags having a Freecharge Tee Shirt, a coffee mug, some tasty cookies and stationary for the day. Freecharge Tour: The group of bloggers were taken around the work space and were introduced to various teams running the show at Freecharge. They were introduced to the Mission Control team which includes SRE, Dev Ops, cloud automation, cloud security & IT, the marketing group, the Analytics team, QA, The Design Mafia (UI & UX), the product managers, the payments team, the technology team, the mobile team! Up, close and candid: Post the tour, the bloggers were welcomed by the CEO of Freecharge, Mr.GovidRajan, and the group had a long, candid session. The fundamental principles that dictate UI/UX strategy for Freecharge are ‘No typing only tapping’and the transaction should happen in less than 10 secs. The emphasis is “faster checkouts’ in anything, and everything consumer does with payments. Govind demonstrated this by doing a recharge on his phone in less than 10 secs; you heard it right – he uses a prepaid connection just like the majority of Indian consumers to understand their psyche.He spoke about the features like ‘Bill Payment Reminder’ and ‘Auto Pay’ that have been a direct outcome of the fundamental principles mentioned above. Govind spoke extensively on the aspect of security – the systems that are in place- so that consumers can have a secure payment experience. He said that Freecharge has built its own (in-house) risky transactions management platform and has a dedicated risk & security team that looks at patterns so that they are always ready to respond to any and every kind of fraudulent actions possible. The platform has been built purely by Indian data and not global data – which makes it even more robust and trustworthy. He added that passwords of users are never stored in the Freecharge system. All passwords are encrypted using one-way non-reversible keys which make it impossible for abuse.Freecharge has assigned every single bank account of the country to pin codes and has a database of risky transaction pin codes. The eye-opening fact was that regarding risky transactions Freecharge is at 1/7th of the Indian benchmark which is better than many top financial institutions.Govind explained that the systems at Freecharge are designed to study 500-600 parameters of the mobile phone and over time have become robust to raise flags when a suspicious transaction are recorded. Elaborating more, he gave an example of the attack on Yahoo wherein Freecharge reached out to all its users who have a registered Yahoo account and made them change their passwords. He said that there are systems in place wherein ‘lock-out’ can happen if a consumer tries beyond ‘x’ times to login and is not able to login.Freecharge has deployed some proprietary technologies to deliver best in class security. It is compliant with all major security standards such as PCI-DSS compliance. The wallet has very stringent protocols on wallet velocity, device fingerprinting, device encryption and identification and hold limits which are designed to trap and eliminate fraud. The proprietary technology ‘On-the-Go-Pin’ (OTP) fulfills the RBI’S mandate for two-factor authentication and does not require even a single additional investment by retailers or a customer, making the transaction secure, swifter and in less than 10 seconds! Govind concluded the elaborate discussion on security by saying “Security is our number 1 priority! We have been voted as India’s most secure start-up and the 2nd most preferred wallet”. Following Govind’s session, there was a panel discussion with Ishan VaishDirector-Products, Fareed Jawad Vice President and Principal Product Architect and Varun Arora, Sr. Product Manager for Risk and Frauds. The trio touched upon various features in the Freecharge app like WhatsApp money through Freecharge, Speed-Pay, etc. An upcoming feature, ‘AutoPay’ was also introduced. Users can now activate AutoPay and completely forget about their recharge and bill due dates. Also, the category of ‘donations’ was introduced wherein users would be able to donate money to various NGOs using the Freecharge wallet and also get the certificate to claim tax exemptions.Varun Arora covered ‘Fraud and Risk’ in the next segment and how Credit Card theft and Account Theft are part of the game. He explained how we at Freecharge are performing high-level fraud checks to minimize and tackle these attacks. This was a session to get up, close and personal with Freecharge and led by the CEO the team at Freecharge shared lot of interesting facts about Freecharge and how they are relentlessly working to give consumers the best digital payment experience in the most secured way.